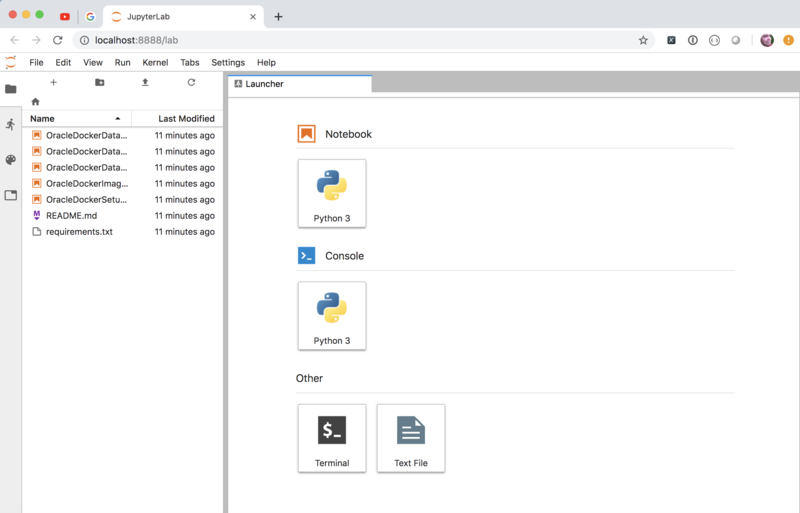 The following walk-through guides you through the steps needed to set up your enviroment to run Jupyter-lab, Oracle and Docker to build and run docker images for testing. This should work for either an on premises install or on Oracle's cloud using IaaS (Compute). This walkthough will serve primarily as a reminder to myself. Comfortable using the Terminal utility. It will prompt you through the install. NOTE : It's possible that it may prompt you to install the XCode command line tools. Say yes. Will show you the installed modules. Next we can create a virtual environment and enable it. This will create a directory called myvirtualenv (you can call it what you like) with it's own version of the python interpreter and pip. Once we "active it", any library we install will only be in this directory and won't effect the system as a whole. We now need to install Git which is useful for managing and versioning code. That might not be a requirement for you but it also makes it very simple to clone existing repostories. Installing it is very simple. We can now clone my IPython/Jupyter notebooks from github which provide you with the code for creating your own Oracle Docker Images. Select Instant Client for Mac OS X (Intel x86) (32-bit and 64-bit) and on the next page select the Version 18.1.0.0.0 (64-bit) Basic Package. When it's downloaded simply unzip it into your home directory. NOTE : You don't need to use pip3 when you have your virtual environment activated. This should take you directly into a browser and the the jupyter environment.